Hidden beneath our shoes and socks, in often sweaty, unventilated conditions, our feet tend to get a pretty rough deal a lot of the time. Spending all day in this hot, cramped environment can leave our feet and toes susceptible to a range fungal and bacterial problems. Apple cider vinegar is a completely safe and natural remedy that has been used for generations as an all purpose health tonic due to its powerful anti-fungal and anti-bacterial properties. Toenail fungus - Our toenails are largely made from a hard substance known as 'Keratin.' In its normal, healthy state, Keratin is a strong, malleable substance that helps to protect our toes. However, when our toenails become infected with a fungal infection, the Keratin becomes brittle and thickens, often with discolouration and an increase in foot odour. Treating this problem with ACV is simple, although it will take some dedication, so don't go looking for instant results. Fill a bowl with warm water, making sure that it is completely clean before use as we don't want any unwanted germs in there. For this remedy we use a ratio of 2 parts water to 1 part ACV. Make sure when buying your apple cider vinegar to only purchase bottles that are both 'raw' and 'unfiltered'. Once we have added the ACV it's time to give the mixture a good stir. Step 4 is optional, but I have found that oregano oil is a great addition to this treatment as, like ACV, it also has powerful anti fungal properties. It's now time to add our feet and allow them to soak for around 15 minutes. Make sure you dry your feet thoroughly afterwards as moisture may cause the fungus to spread. Repeat this process daily for around 2 weeks. You will notice your nails return to a normal colour and no more nasty odours! Corns and Calluses - Often caused by the wearing of inappropriate footwear and its attendant chafing, corns and calluses can become painful over time. However, the natural acids found in apple cider vinegar help to break down the hard structure of these skin abrasions leaving them easy to remove with the use of a pumice stone. For this remedy we need to make a 1:1 solution of raw apple cider vinegar and warm water. Next, add the solution to your chosen foot soaking bowl and allow your feet to rest for around 10 minutes. Before drying, slightly scrub affected areas with a soft pumice stone. The helps to remove the unwanted dead skin. After we have removed the dead skin cells, it's time to submerge your feet for a further 10 minutes. After 10 minutes, dry your feet well using a soft towel. Repeat this process once a week until the callus has completely gone. First clean the affected area - Before treating a wart with apple cider vinegar, it is a good idea to sterilize the surrounding skin. Antibacterial hand wash will do fine for this purpose. Next we want to soak a small piece of cotton pad in raw apple cider vinegar. Squeeze the cotton pad so that it's no longer dripping and use it to cover your wart. Next, it's time to use our medical tape to hold the cotton pad in place. This can be a hard task, especially with our feet. If your wart is in a hard to secure location, it might be a good idea to use this remedy at night when you are less active. The fifth step is to repeat steps 1 - 4 twice a day for around a week. Over this time the wart will retreat and there may be some pain, but after around 7 days your wart will come loose and drop off. 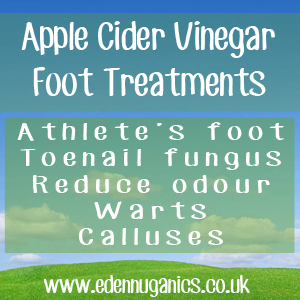 Athlete's Foot - Athlete's Foot is another common fungal infection that can be treated with ACV. Characterised by itching, stinging, and burning between the toes, it is the result of a type of fungi known as 'Dermatophytes' that live in and feed off dead skin tissue found on the feet. Athlete's foot is contagious and spreads easily from person to person. Neat ACV soak - Although we don't tend to advise the use of neat ACV on the skin often in severe cases this can help to speed up the healing process. Cotton pad treatment - When treating athlete's foot it is important to let air get to the foot as much as possible. Throughout the day a cotton pad can be used to cover the affected area in an ACV and oil of oregano solution. Fix Your Athlete's Foot for good!